ID Camps & Clinics July 2nd and July 18th. Sign up for our Spring and Summer Camps! Eclipse owners Dani and Mark Bigelbach traveled with the non-profit organization, CoHope Cares, to Costa Rica for their Mission of Joy Project. The mission included painting a new addition at a primary school in Matapalo, Guanacaste, Costa Rica, with opportunities to interact and play soccer with the beautiful children during their recess time. This past weekend Eclipse Select MN hosted our second annual Winter Showcase. There were a total of thirteen teams that competed in the event. We had teams travel from Nebraska, Iowa and South Dakota, as well as having top level teams from local Minnesota clubs. Eclipse had four teams that were represented in the event. U10 NSC 5v5 Holiday Classic Champions! Congratulations to the U10 girls for winning the NSC 5v5 Holiday Classic! Well done, keep up the great work! Meredith Haakenson who plays center mid for the University of Michigan and Emma Greenfield who is the starting goalie for Washington University both ran training sessions and took time to speak to our girls about their journey's so far. Stay in the Know-Follow us! The National Elite Program provides the highest level experience within our club. The Regional Elite program is designed with less of a commitment to traveling out of state and year round training. The Competitive Program offers players a seasonal soccer experience with team options to add in extra items. 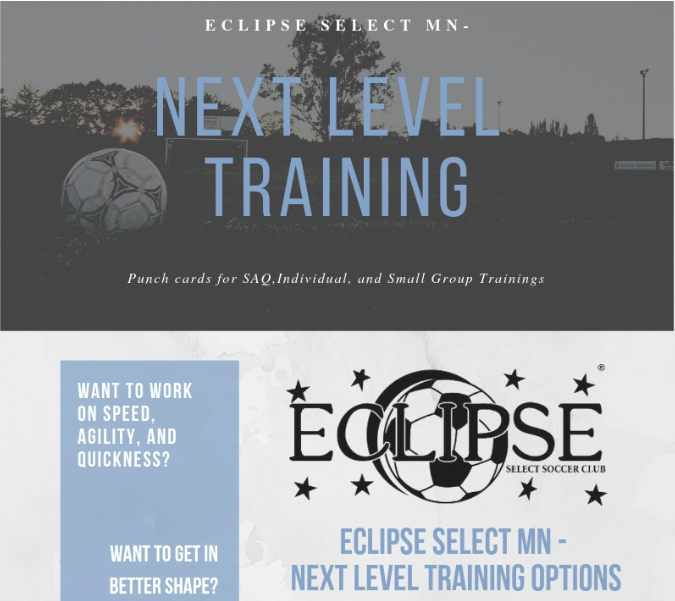 This year-round program helps prepare players who aspire to play for our Eclipse Select Elite Program. This program is designed for kids ages 7-9 and to prepare players who aspire to play for our Eclipse Select Jr Elite Program. The bridge between our Rec Programs and our Traveling Programs. Click On TCO Logo For All Their Services!